Although your new luxury apartment in Falls Church will come equipped with its own gourmet kitchen, sometimes you just crave a cheesy slice of pizza. And who can blame you with the countless amazing pizza restaurants in Northern Virginia (or just NoVa) for you to choose from? That’s why this post is all about celebrating the best pizza you can get within a short drive of Falls Church. Read on to see the five best pizza restaurants in NoVa. Since 1985, Lost Dog Cafe & Gourmet Pizza Deli in Arlington, VA has been slinging some of the very best pizza pies in the DMV. Lost Dog takes the quality of its ingredients very seriously, which is why it has been a consistently great for 30 years. Plus, every purchase here benefits the Lost Dog & Cat Rescue Foundation. That means every pizza bought here comes with a side of compassion. If you’re looking for a no-frills, yet terrific, New York style slice of pizza, head over to Flippin’ Pizza in Falls Church, or one of their other locations in the DMV. All their pies are thin-crust, super crispy, and come with a wide variety of toppings for you to try. We recommend the Whitestone (ricotta, mozzarella, parmesan, fresh garlic, and basil) or the Brooklyn (pepperoni, meatballs, mushrooms, and fresh garlic). You can order a whole pizza here or just go by the slice, so Flippin’ Pizza has you covered no matter how hungry you are. Continually rated as one of the best pizza restaurants in NoVa (and the country), Pizzeria Orso in Falls Church is a must try if you’re a true pizza lover. They specialize in authentic Neapolitan style pizzas. That means you can expect an uncut pizza made with Caputo 00 flour, San Marzano tomatoes, and finished in a volcanic brick oven. A plain Margherita pizza here is something to behold, but their Orso Di Fumare pizza (smoked tomato, mozzarella, roasted peppers, grana padano cheese, sausage, and scallions) is truly spectacular. 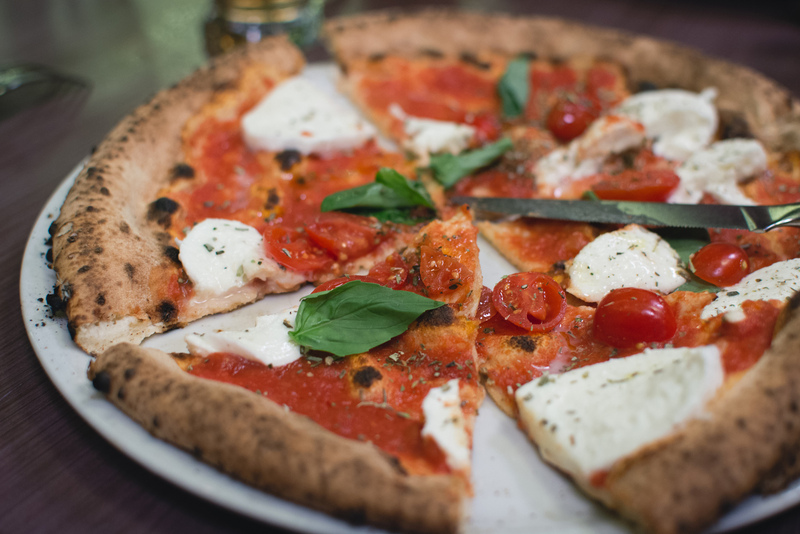 As you can tell from its name, Crust Pizzeria Napoletana in Vienna, VA also specializes in Neapolitan style pizza. However, unlike Pizzeria Orso, Crust uses a wood fired pizza oven instead of brick and is certified authentic by the Associazione Verace PIZZA Napoletana in Italy. While the pizza itself is pretty amazing, you’ll leave Crust Pizzeria talking about just how delicious that pizza crust was. Seriously, it’s that good. Try it for yourself and you’ll see. Taking the top spot on our list is Pupatella in Arlington, VA, which coincidentally, also serves Neapolitan style pizza. Chef Enzo Algarme was born and raised in Naples, Italy and the bricks from the wood-fired pizza oven here come from the ashes of Mount Vesuvius itself. Any one of their traditional red pizzas will blow you away, but if you really want to indulge, try their Burrata Pizza if it’s available. It has extra creamy mozzarella cheese, cherry tomatoes, pine nuts, and basil all on Pupatella’s signature crust and will blow you away. Here at West Broad in Falls Church, we’re lucky to be surrounded by such great pizza. If you’d like to live in this vibrant (and pizza-filled) Northern Virginia community, schedule an appointment to visit the leasing office today. Pre-leasing has already started, so now is the chance to get the first look at West Broad.